In theory federal income tax rates are progressive. Top marginal tax rates increase with income, though not nearly as much as prior to the Reagan administration. In practice effective tax rates tell a completely different story. 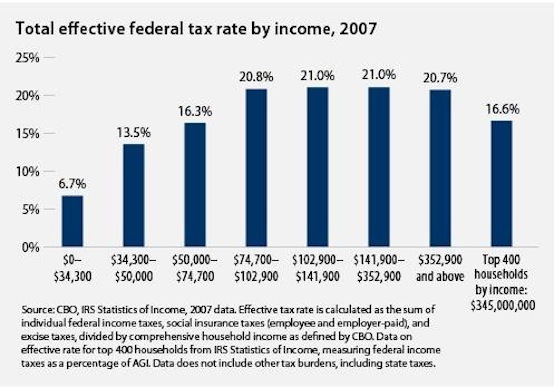 The chart displays total effective federal tax rates by income for 2007 based on data from the Congressional Budget Office. Effective federal tax rate is calculated as the sum of the individual income taxes, social insurance taxes (employee and employer-paid), and excise taxes, divided by comprehensive household income. Panderbear's question is, "What happened to the 'progressive' tax rate structure." True, there is a falloff of the tax rate for the lowest income wage earners, but much of the middle class pays an effective tax rate as high or higher than the mega-rich. The effective tax rate for the $50,000-$74,700 income block is about the same as for the top 400 households. Despite progressive marginal income tax rates, effective rates are essentially flat. In general rich folks are not paying those theoretical high marginal tax rates. Effective tax rates actually fall at the high income end of the scale. Billionaire Warren Buffet pays 17% and quarter-billionaire Mitt Romney pays 15%. Republicans continue to pander about cutting taxes on "job creators," but the sad fact is they have already gamed the system. Cutting their taxes would have the middle class subsidizing the rich even more. Reagan and Bush tax cuts have already resulted in the transfer of trillions of dollars of wealth from non-rich to rich. When is enough, enough? It is true that 99% of the wealth is owned by 1% of the population. But is it also true that those 1% pay for the 99% of our standard of living?